After the government’s surprise announcement on Tuesday (8th November 2016) of making Rs 1,000 and Rs 500 banknotes illegal from midnight, the Reserve Bank of India posted a 25-point detailed FAQs explaining the reasoning behind the move. The central bank said the most important reason for the ban was the abnormal rise in fake currencies of higher denomination, and also the higher incidence of black money in the system, but assured the public that a person who changed his higher value cash will get exactly the equal amount in lower denominations. Here's what you need to do with your 500 and 1000 rupee notes. 1) Why was the scheme introduced? The incidence of fake Indian currency notes in higher denomination has increased. For ordinary people, the fake notes look similar to genuine notes, even though no security feature has been copied. The fake notes are used for anti-national and illegal activities. High denomination notes have been misused by terrorists and for hoarding black money. India remains a cash-based economy, hence, the circulation of fake Indian currency notes continues to be a menace. In order to contain the rising incidence of fake notes and black money, the scheme to withdraw the Rs 500 and Rs 1000 notes has been introduced. 2) What is this scheme? 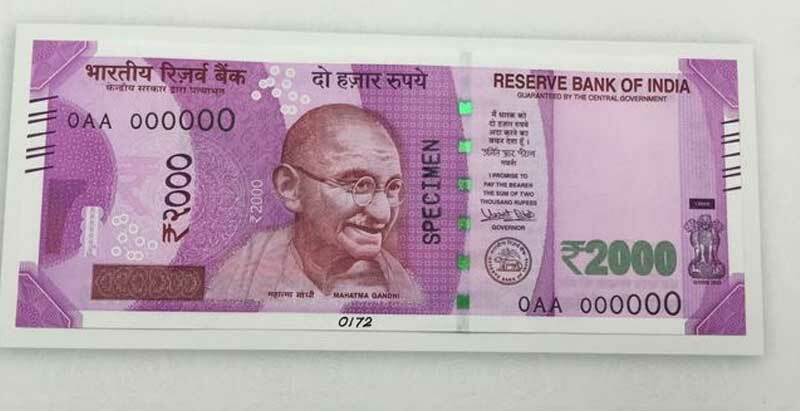 The legal tender character of the existing bank notes in denominations of Rs 500 and Rs 1000 issued by the Reserve bank of India till November 8, 2016 (hereinafter referred to as Specified Bank Notes) stands withdrawn. In consequence thereof, these bank notes cannot be used for transacting business and/or storage of value for future usage. These bank notes can be exchanged for value at any of the 19 offices of the Reserve Bank of India or at any of the bank branches or at any head post office or sub-post office. 3) What value will I get for the old notes? 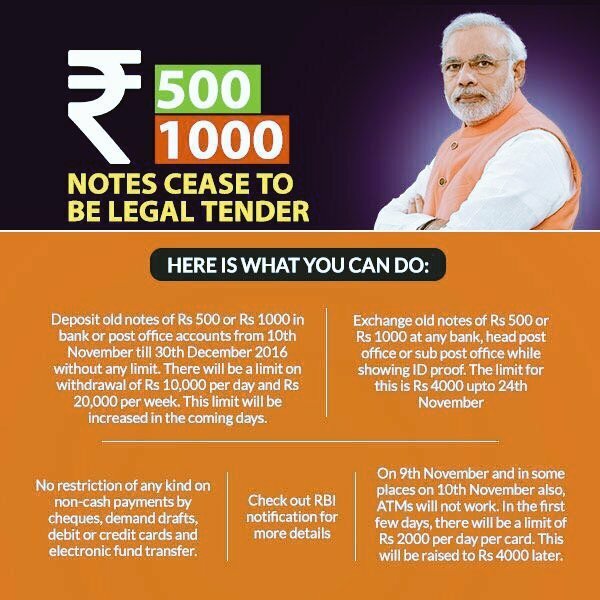 You will get value for the entire volume of notes tendered at the bank branches/RBI offices. 4) Can I get cash for all old notes? No. You will get up to Rs 4000 per person in cash irrespective of the size of tender. Anything over and above that will be receivable by way of credit to bank accounts. 5) Why can’t I get the entire amount in cash when I have surrendered everything in cash? 6) Rs 4000 cash is insufficient for my need. What do I do? 7) What if I don’t have any bank account? You can always open a bank account by approaching a bank branch with necessary documents. 8) What if, if I only have a Jan-Dhan Yojana account? A Jan-Dhan Yojana account holder can avail the exchange facility subject to the caps and other laid down limits in accordance with norms and procedures. 9) Where can I go to exchange the notes? The exchange facility is available at all issue offices of the RBI and branches of commercial banks/RRBS/UCBs/state co-op banks or at any head post office or sub-post office. 10) Need I go to my bank branch? For exchange of up to Rs 4000 in cash, you may go to any bank branch with a valid identity proof. For exchange of over Rs 4000, which will be accorded through credit to bank account only, you may go to the branch where you have an account or to any other branch of the same bank. 11) Can I go to any branch of my bank? 12) Can I go to any branch of any other bank? Yes, you can go to any branch of any other bank. In that case you have to furnish valid identity proof for exchange in cash; both valid identity proof and bank account details will be required for electronic fund transfer in case the amount to be exchanged exceeds Rs 4000. 13) I have no account but my relative/friend has an account, can I get my notes exchanged into that account? Yes, you can do that if the account holder gives you permission in writing. While exchanging, you should provide to the bank evidence of permission given by the account holder and your valid identity proof. 14) Should I go to the bank personally or can I send the notes through my representative? Personal visit to the branch is preferable. In case it is not possible for you to visit the branch, you may send your representative with an express mandate, i.e. a written authorisation. The representative should produce authority letter and his/her valid identity proof while tendering the notes. 15) Can I withdraw money from ATMs? It may take a while for the banks to recalibrate their ATMs. Once the ATMs are functional, you can withdraw from ATMs up to a maximum of Rs 2,000 per card per till November 18. The limit will be raised to Rs 4000 per day per card from November 19. 16) Can I withdraw cash against cheque? Yes, you can withdraw cash against withdrawal slip or cheque subject to ceiling of Rs 10,000 in a day within an overall limit of Rs 20,000 in a week (including withdrawals from ATMs) up to November 24, after which these limits shall be reviewed. 17) Can I deposit specified bank notes through ATMs, cash deposit machines or cash recycler? Yes, specified bank notes can be deposited at cash deposits machines/cash recyclers. 18) Can use the electronic mode (NEFT/RTGS /IMPS/ internet banking/mobile banking, etc.) ? You can use NEFT/RTGS/IMPS/internet banking/mobile banking or any other electronic/non-cash mode of payment. 19) How much time do I have to exchange the notes? The scheme closes on December 30. The specified banknotes can be exchanged at branches of commercial banks, regional rural banks, urban cooperative banks, state cooperative banks and the RBI till December 30. For those who are unable to exchange their specified bank notes on or before December 30, an opportunity will be given to them to do so at specified offices of the RBI, along with necessary documentation as may be specified by the central bank. 20) I am not in India right now, what should I do? 21) I am an NRI and hold an NRO account, can the exchange value be deposited in my account? 22) I am a foreign tourist and I have these notes, what do I do? You can purchase foreign exchange equivalent to Rs 5000 using these specified bank notes at airport exchange counters within 72 hours after the notification, provided you present proof of purchasing the specified bank notes. 23) I have an emergency need of cash (hospitalisation, travel, life-saving medicines). What should I do? 24) What is a proof of identity? Valid Identity proof is any of the following: Aadhaar card, driving license, voter ID card, passport, NREGA card, PAN card, identity card issued by the government, public sector unit to its staff. 25) Where can I get more information on this scheme? Further information is available on our website (www.rbi.org.in) and the website of the finance ministry (www.finmin.nic.in). 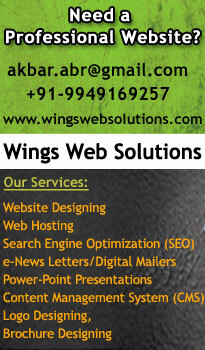 You may approach the control room of RBI by email or over the telephone: 022 22602201/022 22602944.